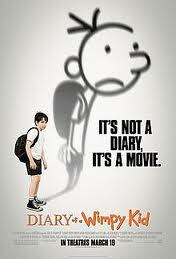 Anyone see the movie "Diary of a Wimpy Kid"? I haven't yet - I thought it looked like it could have been cute, but I'm not completely decided on it. Remember when you used to live at home (or if you still do) and your mom would go through your room to find your diary key? And then she would sneak to read your diary when you weren’t around. Hopefully there wasn’t much in there that you didn’t want her to know – you know she found it. We spent a good part of Sunday afternoon/evening with my family. It was great seeing them, but my mom wasn’t feeling well. She has been going through some medical issues that we have been working through, and it really puts things in perspective. I have found that one of the strangest part for me is realizing that there is that sort of role reversal. You are now the one that is looking out for your parent…and the best way to describe it is weird. It’s sort of this awe of being a grown up, it is partly the realization that your parents aren’t invincible, it is scary because the whole element of our mortality comes into focus, and most of all you just want to be there and do what is right for them to make them all better. Today’s company supports something that is close to my heart these days. A portion of the proceeds from their SHAVEWORKS The Cool Fix (which is made for women, but can be used by men) line is be donated to the Leukemia & Lymphoma Society. Every 4 minutes one person is diagnosed with a blood cancer. An estimated 139,860 people in the United States will be diagnosed with leukemia, lymphoma or myeloma in 2009. New cases of leukemia, Hodgkin and non-Hodgkin lymphoma and myeloma account for 9.5 percent of the 1,479,350 new cancer cases diagnosed in the United States this year*. I’m not sure if any of you have tried (for the guys) or know someone who might have tried any of the products from Anthony for Men but they have some great products! My hubby has used a few of the different shaving creams that they offer and has been happy with them – and so am I because they smell really good too! Anthony for Men offers different lines of products for the different needs of your man (or for you for my male readers!). To find out which line/brand would be the best fit for you - go to http://www.anthony.com/our-brands/. We might even thank you for it!